Welcome to 'TIPS UP' condo! You can't help but feel right at home in this beautifully renovated 2BR/2BA SKI-OUT townhouse located in the Shamrock community. Our privately owned unit is completely updated and is considered a GOLD-rated unit by Snowshoe. Our back door is just 15 yards from the new Shamrock ski trail (complete with snowmaking capability) - a true ski-out unit! 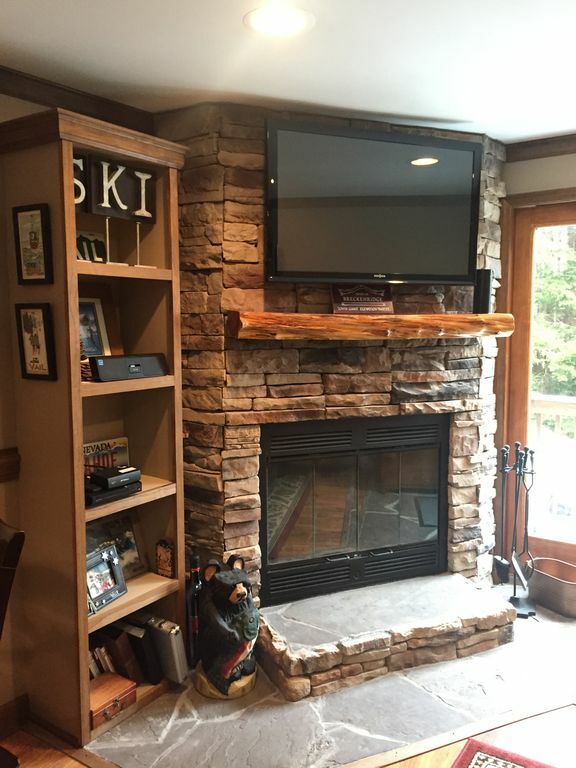 Ski out and enjoy a day on the slopes, and then come back in the evening to relax in front of a warm fire and enjoy a home-cooked meal in our fully stocked kitchen (or head out to enjoy a bit of the Snowshoe nightlife!). If you choose to rent our unit, we promise you a CLEAN and comfortable piece of WV heaven. Our unit is a 2-story 2BR/2BA, with private entrance and private parking right in front of the unit. We just completed a complete renovation of the master bedroom and bath in fall 2017! The bedroom was expanded to accommodate a new king size bed (with brand new high quality cushion firm mattress - a little piece of heaven after a long day on the slopes! ), and complete bathroom remodel including new tile surround tub and large custom quartz vanity. The downstairs level has also been completely remodeled and now features a completely updated (and stocked!) kitchen with quartz countertops, eating area, living room with a beautiful new Ashley leather sofa, 42' flat screen tv, and a beautiful new wood-burning fireplace. The heated mudroom (also completely renovated) is the perfect place to take off and store all of your ski gear after a day on the slopes. Off of the kitchen on the lower level is a full bath, washer/dryer, and a bedroom with a new QUEEN SIZE BED with pull-out TWIN TRUNDLE (perfect for children!). The upstairs level of the unit has one bedroom with a KING SIZE BED, large closet, and one full bath. Linens and towels are all provided free of charge! IF you want to stay connected, there is high speed cable modem with wireless internet access and a landline phone with free unlimited long distance calling provided for our guests! The Shamrock complex itself just finished a complete exterior renovation project, including new mudrooms, roofing and siding. The new mudrooms are a perfect place to securely store all your outside gear (skis, boots, bikes, etc), opening up a lot of space inside the condo itself. In short, the place looks great! The Shamrock complex is located just on the other side of Wistlepunk, and is just a very short walk to the village (5 min) but at the same time allows you to truly enjoy the quiet solitude of the mountains. Deer gather regularly outside the back deck and love to snack on everything from corn to Fritos! All of this with ski-out access too! Bed linens and bath towels are provided FREE of charge! Wood-burning fireplace - kindling wood and logs are also provided FREE of charge!! Park directly in front of your unit! Fully stocked kitchen - everything you need to cook! Complex also has a wonderful kids play area with swings, a play pirate ship, basketball hoop, etc. Truly SKI OUT!! The Shamrock ski slope (complete with snowmaking capability to ensure snow coverage) is only 15 yards from the front door!! We’re from FL and this was first time in Snowshoe MTN. The place was beautiful and the location was perfect. Loved the whole inside of the condo and perfect size. We felt right at home and enjoyed every moment. There were no issues with anything and if I had any questions Jen got back to me quickly. Already looking into next year same place so we can make this a yearly tradition. Tips Up is totally cute and comfortable! It has everything you need and the complex is clean and quite. We had a great weekend in the mountains. Can’t wait to come back. I rented this property with a few girls for the Wanderlust Festival. The location is a short walk to the shops and restaurants. The house is super cute with a nice little back yard where you can watch bunnies, deer and other wildlife! The rooms were clean and kitchen fully stocked. I would highly reccomend this property. Shamrock #43 was an absolutely perfect place to stay at Snowshoe! Our family loved everything about the condo and Jen was fantastic to deal with! The condo was exactly as described! It was very clean, beautifully decorated, cozy and convenient! Beds and furniture were very comfortable and the heated mudroom was very convenient! Skiing out from the condo was also convenient. We loved the fireplace and used it every night! The kids had a great time playing out back in all of the snow we got during our trip and absolutely loved feeding the many deer that came so close to the deck! Jen was super easy to communicate with and the packet of information she provided prior to check-in was very detailed and helpful! She was a joy to work with and we look forward to staying in her condo again in years to come! Had a very nice time at “tips up”. Owners were good to work with and the condo was as clean and comfortable. Would stay again in the future. An amazing place to spend our Christmas vacation! If there were more stars I would give it more! This unit was top of the line in all aspects. Drive to the front door and a short distance to slopes. Ski in ski out except that we went very early in the season. Normally condos are overstated in pics but this unit was above expectations. Modern , updated and clean, it was amazing for our family of 6. Great heated mud room to store and dry your gear, comfortable beds and furniture, well stocked kitchen, beautiful fireplace located by back door so you can watch the deer, and on and on! On top of that the Jen (the owner) was extremely accommodating for our last minute plans. We hope to stay again soon!